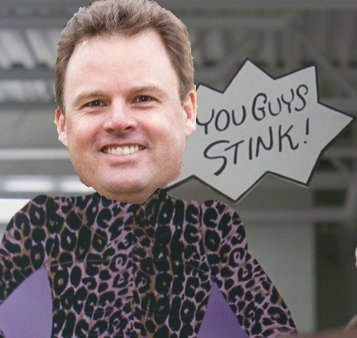 Columbus, OH - The cardboard cutout of Crew owner Anthony Precourt only has three pieces of clothing left upon it as the Crew continue to use the disgraced owner as fodder for their playoff run. "We needed something to galvanize this team and the fact that Precourt is trying to move all of the players and the staff and abandon Columbus was a pretty strong motivator," stated team insider Bragg Gerhelter. "We decided to rip off Major League because it's essentially the same thing, at this point. Every time we win a game and get closer to MLS cup, we remove a piece of clothing." Gerhelter stated that he isn't certain why this is a motivator for the players but that the prospect of winning MLS Cup as a final thank you to Columbus is something that continues to be relevant. "We don't have to have a reason why this makes sense, we just need to keep winning. Because the only thing that is keeping soccer in Columbus is the Crew winning and the fans supporting." The Nutmeg News will have more on this as Tom Berenger asks if the Crew could use a midfielder.